More than likely you’re here because you’ve made the leap or are thinking of making the leap in investing in a Real Monitoring Solution. Congrats. You’re one step closer to having the power of user metrics working in your favor. Real User Monitoring is a way for your users to communicate with you how satisfied they were when they interacted with your website or webapp, so how can you be sure you’re listening correctly? Check out the 5 ways to make the most out of your RUM solution and become a user-data-whisperer. 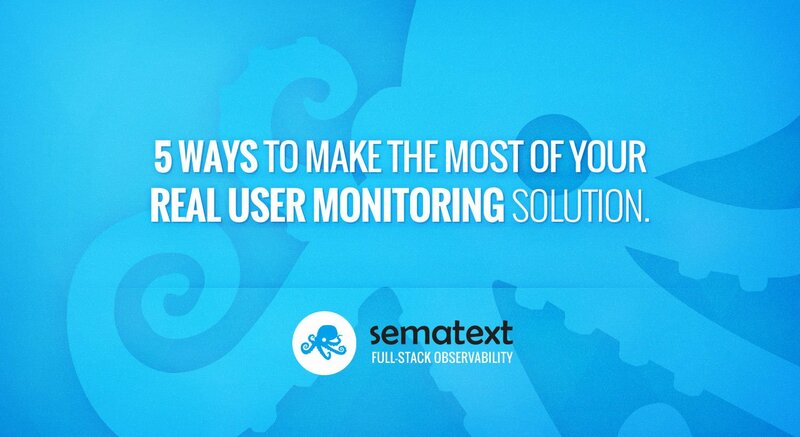 Let’s start with a basic intro to Real User Monitoring. Real User Monitoring, or RUM, is a type of monitoring technology for digital businesses. Unlike synthetic monitoring, RUM analyzes customers’ digital user experience by looking at exactly how online visitors are interacting with a website or application, analyzing everything from page load events to AJAX requests, to computing Apdex, to capturing frontend application crashes. This monitoring software is part of APM (Application Performance Monitoring) and it allows you to stay in control of your users’ digital experience, and in turn, their level of satisfaction. What’s the difference between RUM and APM? Check out RUM vs. APM: How they’re Similar and Different. For Real User Monitoring to be effective we first have to make sure we are using it correctly. Today we will go through 5 ways to make the most of your RUM solution. Don’t be that person that tests in production! Before deploying any software into production most DevOps teams run QA Testing or Quality Assurance Testing. This allows you to test your new product or feature and fix any bugs before your users discover them. Normally a DevOps team could spend from 2 days to 2 months running QA tests and fixing any bugs, errors or crashes. Why does it take so long you may ask? There are a million ways your users will end up using your new feature or product and through this quality assurance process, you are putting yourself in their shoes to understand what challenges they may face when using your new feature or product. In today’s competitive landscape any issue your users encounter while interacting with your website or webapp will be a reason to have them running in the direction of your competitors. Let’s make sure that doesn’t happen. Test your product and features before running them in production. We recommend testing variations, different environments (browsers, servers, etc.) to assure maximum quality. Whenever you release a new version of your website or webapp, you should be able to notify your RUM solution by sending a specific type of “release event”, and upload source maps for that particular release. You will also be able to send the release version in metadata of all events sent from end users so they can later filter events by release version. Sematext Experience will allow developers to upload source maps directly to Sematext Cloud via our public API or download the source maps by looking at the source map url defined in minified source files. Help improve your users’ digital experience and in turn, improve & measure user satisfaction with RUM’s Apdex Score. Real User Monitoring is not to be mistaken with Google Analytics or GA. RUM is for DevOps but its performance metrics can be applied all throughout your organization. GA user tracking won’t provide insights into customer satisfaction, Apdex Score, Crash Reports, etc. A Real User Monitoring solution is a comprehensive tool that gives you a bird’s eye view of your customer’s experience, whereas GA is more for traffic sources, bounce rate, etc. And many more possible errors related to containers, servers, etc. So in these cases, for example, combining your Real User Monitoring data with that of a Log Management/Log Analysis tool with Transaction Tracing and Infrastructure Monitoring will give you more flexibility to troubleshoot, spot bottlenecks and sort through the enormous amount of data that exists in your software. Of course, all these tools can be time-consuming, especially if you have to switch between different tools and vendors, so be sure to invest in a system monitoring solution that allows you to correlate metrics & logs, monitor your users’ digital experience, and spot slow transactions. We know how important it is to have a unified solution, which is why Sematext Cloud offers Full-Stack Observability thus allowing you to get actionable insights much faster than that of separate platforms or vendors. So you’ve invested in a comprehensive monitoring solution, you’ve debugged x number of errors, increased speed, and improved your all over customer experience by x%, sounds like a happily ever after right? How has this actually affected your business though? Let’s break it down. A normal DevOps team spends hours and hours a week troubleshooting performance related issues, which in turn does not allow these developers to focus on building new features, expanding current features and building new products. No evolution = Stagnation. Additionally, improvement in performance management allows you to lower bounce rates, increase conversions, lower abandoned visits, etc. Ultimately a faster website is going to make you more money than a slow website – so make sure you share all this powerful data with your BizOps and RevOps team(s)! Modern-day user experience optimization requires a comprehensive solution that will provide you with actionable insights. For example, Digital Advertising is now almost entirely being delivered by third-party code which has a huge (and direct) impact on your website’s or application’s user experience (UX). Another use-case could be payment gateways on an e-commerce website. Of course, without a payment gateway an e-commerce site wouldn’t function, but by analyzing this data and third-party failure you can communicate this to your payment gateway provider easier and get them onboard to improve speed. Other third-party code, like for example, A/B Testing or analytics doesn’t add any value to your users, and in turn, can be taken out from the load process. Remove it – either forever or for an extended period of time when you need your site to perform as fast as possible. One example can be in the holiday season when you have more traffic coming on your site if you’re an e-commerce for example. Your second option is to replace it. Find another provider that does not affect your site speed. But before you implement this third-party code, be sure to test it! Filter data by release version, browser, version, geo-location, etc.